I actually started writing this blog post about a month ago, at that time I felt no inspiration. What story should I share to make this post interesting? I guess there never is really a story in all of my posts, it’s just about the food, about the experience and about the love for all these small little cakes, brownies, cheesecakes… that can make my life feel so perfect for such a tiny moment, in the midst of all the hectic schedule of quizzes, tests and homework. After my final quiz for this semester, I finally found myself sitting down in front of my laptop and start typing out this blog post. It is embarrassing, for I have not been posting stuff at all for the past one month. Every week is the same for me – study from Monday to Friday; go back home on Friday evening, staying at home for only Saturday and Sunday before moving back into hall on Sunday night. Weekends seem to be the only days to bake right now, however, with the extremely lazy moi, I often wasted it away sleeping or watching all the drama series. I don’t bake as often anymore, but I still cook. Funny though, I don’t really have the habit to take photos of cooked food. Maybe because I don’t’ know how to make them look presentable and pretty, unlike cakes and other baked goods – there are a lot of ways to make them look presentable, cute, lovely and yummy all at the same time. I baked this cheesecake for my friend’s birthday (once again). I am in this phase that I don’t want anything that is too overly chocolaty. Chocolate cakes? No. Chocolate brownies? Nay. Chocolate, chocolate chocolate? No, nope, nah. I still love chocolate, mind you, but I do not want to bake something that is wholly chocolate. Only parts of it. I think this phase is passing and I will be back to baking chocolate baked goods. While I am out of the chocolate phase, I am into the cheesecake phase. It’s funny, how a cheesecake-disliker like me gets wound up into loving cheesecake so much. Did I tell you how I got that ‘enlightenment’? Haha. I still remembered clearly that it was on a Primary class gathering at our friend’s house. And one of them brought a cheesecake made by her brother. It was so delicate, not overly sweet, light and luscious all at the same time. It was a no-bake cheesecake, with graham crackers as the base, and then layered with various fruits and then the cheesecake batter is poured over the fruits and then refrigerated into perfection. That’s the first time I have eaten a cheesecake and at that moment I know I am in for something good. 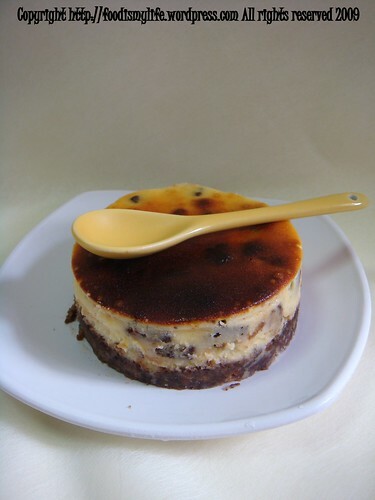 Cheesecakes sold at bakeries and cafés are normally big, fat and tall. The crumb crust is normally thin and the cheesecake batter is so overwhelmingly too much that sometimes I find it hard to finish it, especially when they are rich and creamy. This cheesecake that I baked was a very short cheesecake. They are only about 2 inches tall, and I think 4 inches in diameter, crumbs and all, but I think they offer a much better balance than traditional cheesecakes. And obviously, they are much cuter to look at! 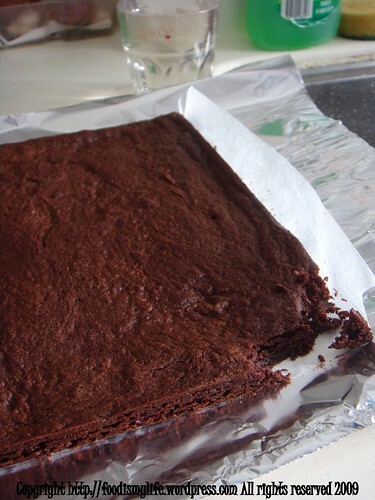 It’s easier to cut the brownies after refrigerating them. Yummy! After the brownies, it’s time for the crust. The recipe called for chocolate teddy biscuits. I opted for a half teddy biscuits and half chocolate digestives. 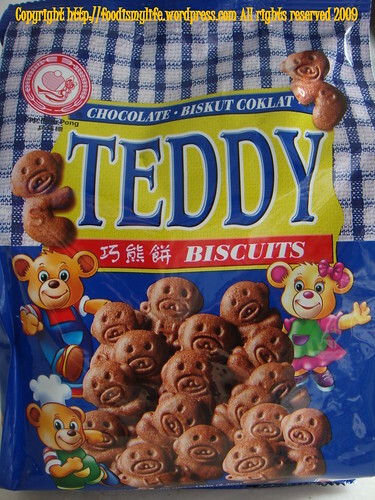 These teddy biscuits are reminiscence of my childhood. When I was young, they were sold in small little packets costing around 50 cents per packet, and I would always savour these biscuits, taking a small bite each time. 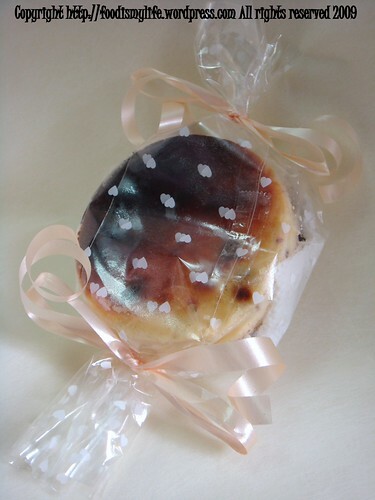 They are not very good quality chocolate biscuits, but I would know nothing of that when I’m so young, would I? Brings back lots of childhood memories. Have you eaten anything recently that’s bringing you back to your childhood? All the biscuits go into a Ziploc back and then are bashed using a rolling pin into fine crumbs before mixed into melted butter and then pressed into little ring moulds. I used a double crust and manage to get them into 4 4-inch ring moulds. These ring moulds that I used are bottomless. I place them on a baking sheet and just fill them with the crust and then the cheesecake batter. Well I do not intend to bake it in a water bath so I guess that is why I don’t really care about using a ring mould with a bottom. It will also make the removal of cheesecake from the mould much easier. I wonder what’s hidden inside the walls of the chocolate goodness? When it comes to making the cheesecake crust, I am 100% for a thick crust. 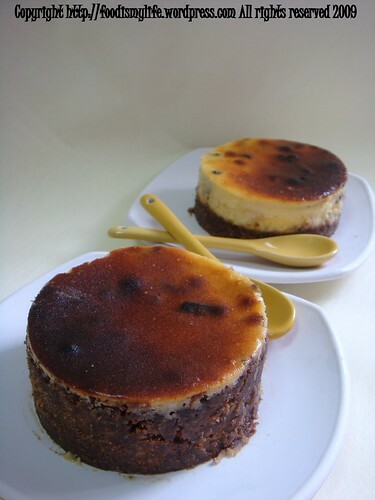 Cheesecakes that are sold outside normally have a very thin crust and a thick layer of cheesecake. The proportion is out, in my opinion. But then again, I am one who loves to eat biscuit crust that’s why I prefer a thicker crust. I guess the best ratio of cheesecake to crust for me so far would be 3:1 or 4:1 (in terms of thickness). Some like the cheesecake to come up all the way to the sides while some like to see the different layers in the cheesecake. 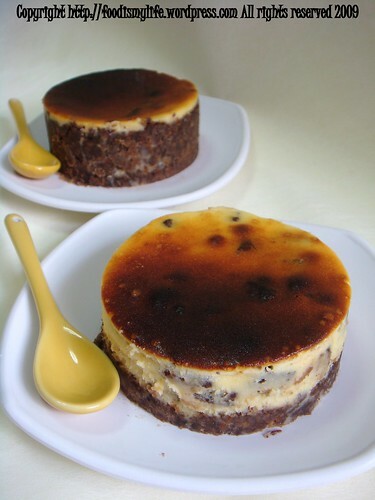 For me, I would prefer the crust to come up all the way to the sides; however, it also makes the removal of the cheesecake tougher. Well, one can never always get the best of both worlds, can they? The one that has the layers also look prettier, in my opinion. Another problem is that my cheesecakes were swimming in butter when they finish baking. My guess is that the butter used to mix with the biscuit crumbs melted and seeped out of the ring mould. Again, I am not sure if that affected the taste of the cheesecake. Nevertheless, I’m not going to complain. Smitten Kitchen also asked for a ganache but since I am not in the chocolate phase, I omitted it and left it plain. I think it would be too much with the ganache added, but that’s just me. Overall, this cheesecake is absolutely delicious and fantastic. 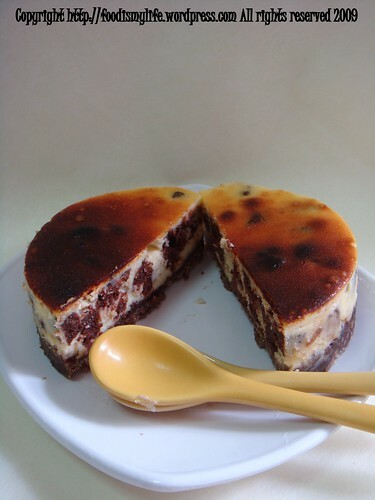 It is a must-try if you are in love with brownies and cheesecake. The brownies tasted like soft chocolate cubes. 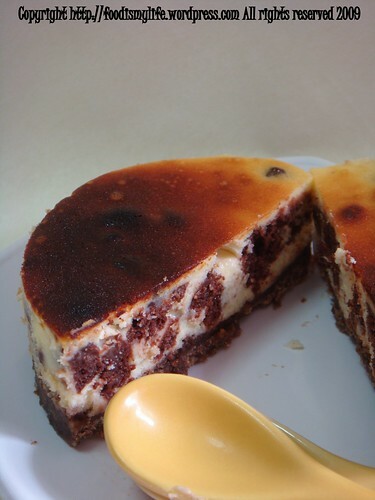 The cheesecake is creamy and rich, but well balanced with the thick-enough chocolate crust. I would definitely make this again but this weekend, I will need to bake some brownies first, if I can get some time out. Preheat the oven to 190 degrees Celsius. This time I used a shallow 9 inch square tin. Grease it and lay piece of baking paper at the bottom, slightly extending the sides. Depending on the size of your cheesecake, you might want a smaller tin to bake thicker brownies. Melt the chocolate and butter in a bowl over a pan of simmering water (double boiler), then remove from the heat and set aside to cool slightly. Beat the eggs, sugar and vanilla until the sugar has been incorporated. Stir in the melted chocolate mixture with a large rubber spatula before gently folding in the flour till combined. Try not to overmix. Pour the batter into the prepared tin and bake for 15 to 25 minutes until the center is just firm to the touch. The insides will still be slightly wet so don’t use the tooth-pick test – it won’t be accurate! Set the tin on a wire rack to cool completely. I used a mix of chocolate digestive biscuits and teddy biscuits. Graham crackers work well too. Set 4 4-inch ring moulds into a baking sheet. Stir together crust ingredients and press onto bottom and 1 inch up side of the ring moulds. Fill right away or chill up to 2 hours. If you fancy, use a 8-inch springform pan. Let’s split it open… and then take a closer look! Make crumb crust as directed above. Preheat oven to 170 degrees Celsius. 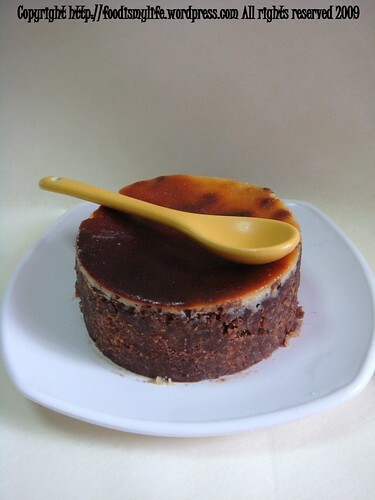 Make filling and bake cake: Beat cream cheese and sugar with an electric mixer until fluffy, about 5 minutes. Then beat in eggs, 1 at a time, and then vanilla, beating on low speed until each ingredient is incorporated and scraping down bowl between additions. 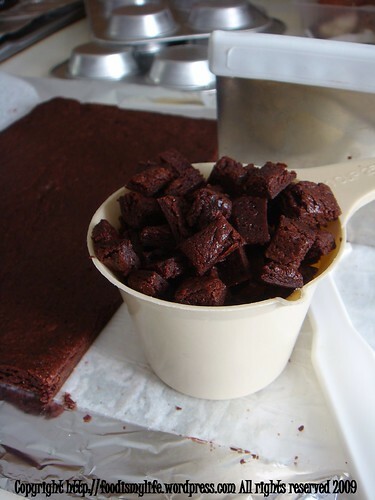 Fold brownie cubes in very gently. Pour filling into crust and bake in baking pan (to catch drips) in middle of oven 20 minutes, or until cake is set but center is still slightly wobbly when pan is gently shaken. Let cool completely on a rack. Transfer (with the ring moulds) onto a new clean plate and refrigerate overnight. The little brownies look like chocolate chunks! Once again, a very very happy belated birthday to the birthday girl A! thanks once again!!! :D:D loved it! and i am craving for more……..